This base reinterprets the charm of classicism in the contemporary time with a lavishly dynamic and simply powerful rhythm, drawing inspiration from the trends of times. 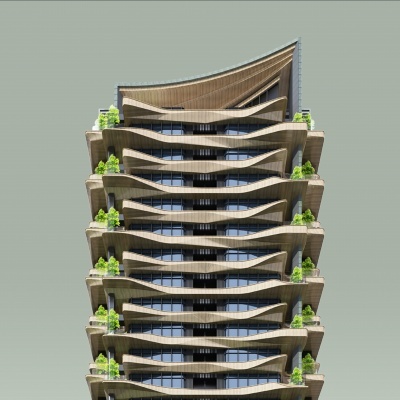 The base faces towards the widest river in Hsinchu, with the shape of its balcony moulded in a natural curvy spirit. 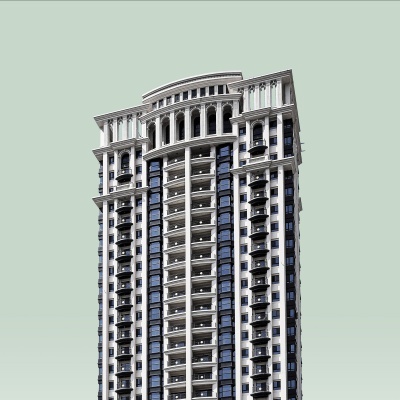 On the pedestal that belongs to the earth, a multilevel arch is used to echo the curve of the balcony and the river. The giant glass curtain borrows scenery from the sky, while contrasting the exterior of a natural stone texture. This organic and classical style which is both exquisite and rich in texture creates an architectural vocabulary not just fashionable in thinking, but also classic in character. 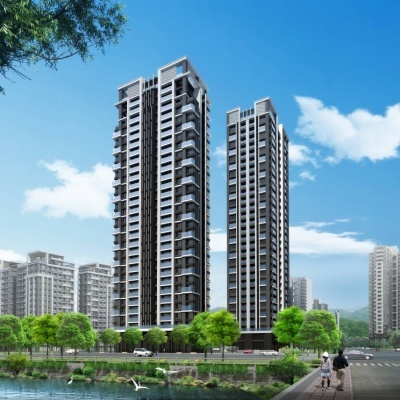 The project faces a wide lake within the Hsinchu Science and Industrial Park. The design concept is to bring the clear mirrored lines in the water along with the sky into the building. Reflections of the large-surfaced glass are crystallized into the lake. Changes in the sky and water as well as the gradual transformation of the four seasons are embedded into the daily lives of residents in the reflection of the building. 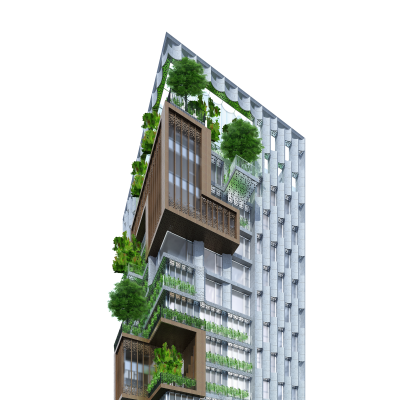 Inspired by the richness and sweetness of the oasis and greenery, this building inlays the intertwined foliage of trees and wall plants into the skyline of Taichung. With an earthy tone, it develops an earthy color spectrum that belongs exclusively to the oasis in the sky. 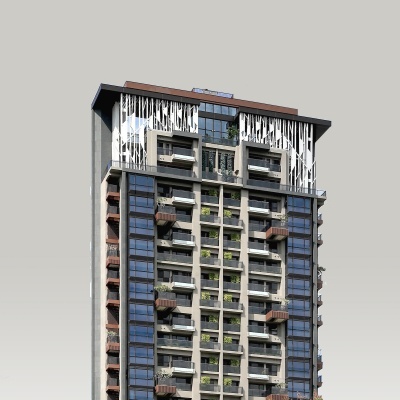 The thick brown and the warm earthy colors are woven together to create a distinct architectural expression that can be seen nowhere else but in natural jungles cocooned in branches and leaves. 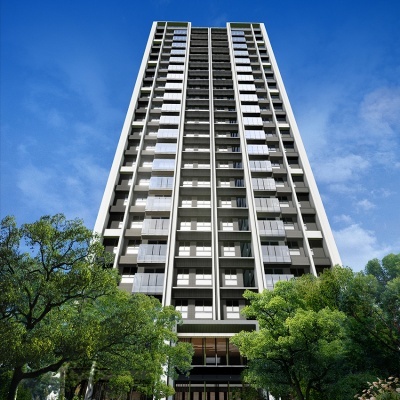 It aims to carve a natural tone exclusive to the sky in Taichung, as well as a contemporary green residential style blooming with vitality and elegance. Inheriting the organic and classic architectural style with a dynamic and rhythmic order, this base draws on this strong sense of order but attempts to transform the natural elements in a geometric manner. Weakening the curved imagery while increasing the sense of extension from the verticality of the pillars, it creates a high-spirited attitude manifested in a multilevel geometric form. Through this technique of collage and contrast it connects the earth and the sky, which are in turn condensed into this contemporary organic classicism. The base is located at an intersection, with Green Park Boulevard, Jhongtai East Road in the west and the Botanical Garden in the south across from Jiansing Road. It is a residential area surrounded by greenery. 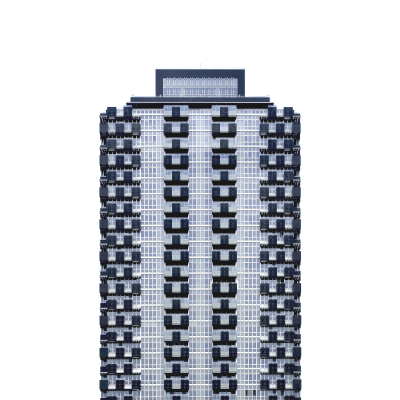 Except for the high-rise 21-storey apartment building westward, it consists mostly of low-rise residential buildings with an open and nice green view. In this estate, we bring the greenery of the surrounding environment into the living area, allowing each household to have the green sea of the botanical garden as the backdrop and the layered tall trees as close-up decorations to create a living environment full of green touches. Looking from the botanical garden to the building, the greenery of the botanical garden is extended to the facade of the building. This estate is located in the long-angled intersection of Hueiwun Road and Dadun Shih Street, with the south of the estate served as parking space neighboring the Wunsin Forest Park, which allows ample space between buildings and excellent views; in the north it faces a high-rise residential area, forming a wonderful Taichung skyline. The design goal of the facade of the estate and the various public spaces is a fusion of style and classicism. We determine the priorities and the foils based on the principle of the division of facades in classic architecture, take its essence, and combine it with novel elements and minimalist design styles to strike a balance between fashion and classicality. The base is located on Art Garden Boulevard in Taichung, shaded by green trees on both sides. We hope to build the site as a bridge connecting the green belts - a carrier of the green and a mountain amidst the urban city. The trees standing by the open landscape balcony are layered to form a harmonious organism. They extend from the park boulevard into the building, making the building and the environment one with each other. 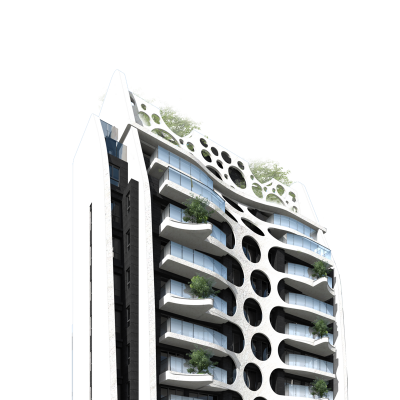 Inspired by leaf tissues, the building's facade adopted their porous surface. 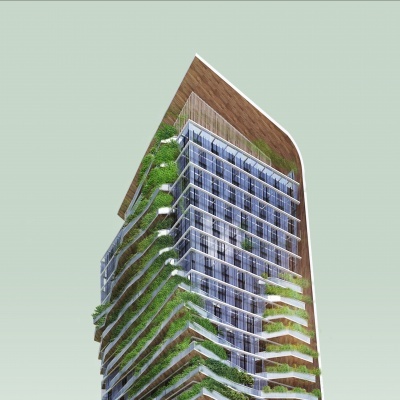 It is an organic exterior combining the functions of ventilation and greening. The land site benefits from direct frontage to the largest urban park in Taiwan, inspiring the design concept of living in a garden city. We want to extend the greenery and healing qualities of the park to give the residents a fully green lifestyle. 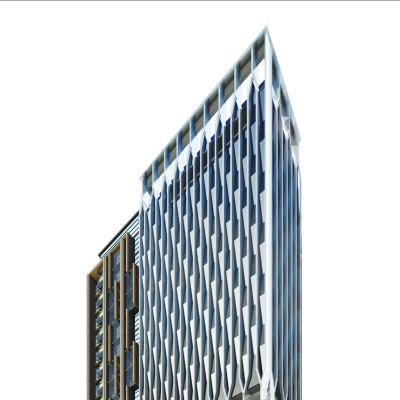 Each unit benefits from the staggered sky garden balconies, receiving lighting and ventilation from the park at all times. 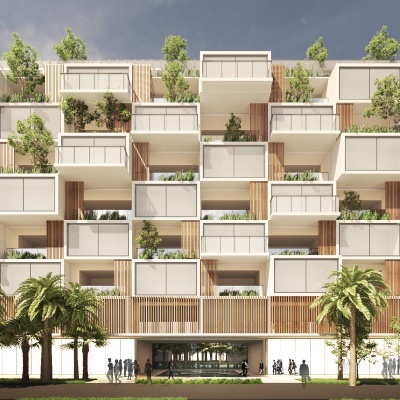 Residents may plant organic herb plants and simple vegetable gardens in the balconies, creating a living façade that has a dynamic rhythm at all times of the day and natural food at your fingertips. This case simplifies the lines of the building in a minimalist manner, and enhances the layering of the lines so that the body of the building appears to present a strong and powerful vibe under the sun's rays. At the same time, it utilizes wide glass windows and stones to interweave a visually stable and straight-forward sense of harmony. The geometric lines regress and stack up, and with the warm-hued shades of color they present an architectural imagery transformed by geometrical techniques while still echoing the extensive veins of the earth. This prudent and humble gesture perfectly expresses the Confucian connotation within the international corporation. The estate locates beside a main road in the city with pleasant and laid-back avenues and is adjacent to rolling mountains and close to a large park. 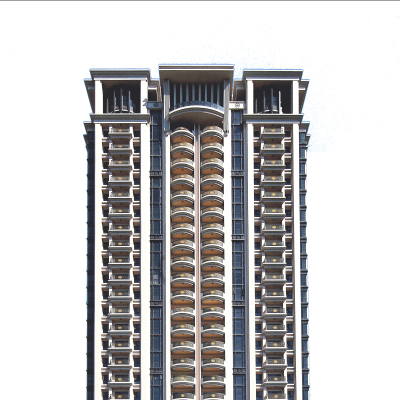 The design concept of this estate is a glass box surrounded by the scenery of the sky, with its prominent balcony and shade grille on the exterior creating a simple architectural expression. On the southern side, white panels are used to outline the glass windows that borrow scenery from distant mountains, creating an interesting fusion of reality and illusion on the facade. At the same time, the contrast of the dark and light textures on the balcony railings maximize the three-dimensional dynamic beauty of the clean and orderly glass box. This combination of reality and illusion is maneuvered so that the mountain view and city view outside the window can be felt in the interior, and the brightness and dynamics of the interior can also be extended into the city. The concept of this case is to introduce the analysis of science and technology and cast the spirit of green architecture fully on the architectural expression. 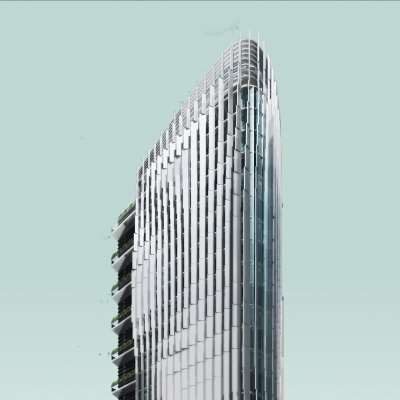 In addition to the three-dimensional greening system, the amount of solar radiation and the angle of the building is measured and analyzed through the coordinate of the base and the sunlight (which is the heat gain of the facade). Then, the indoor heat and glare caused by solar radiation are reduced with the concept of a double wall, thereby cutting down the use of air conditioners and the extent of discomfort in space usage. This layer of outer wall of serves as a vertical sun visor that adapts to the angle of sunlight. Through the change of light and shadow, not only is the heat from the sun eased inside, but also the unique architectural expression exclusive to this place is born. 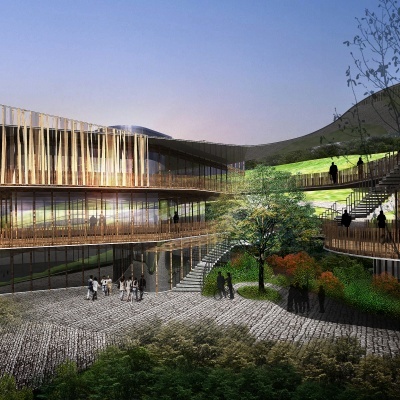 This building is a combination of environmental thinking and eco-friendly architecture that aims to create a dialogue model closely integrated with land and city. This case is located at the intersection of Taiwan Avenue and Chaofu 2 Street, where there is heavy traffic. To create a tranquil and elegant first impression, the entrance of the hotel is set in the southeast corner of Sin Jhuang Zih Creek. This avoids the burdening the congestion on Taiwan Avenue and allows guests to be relaxed while entering. 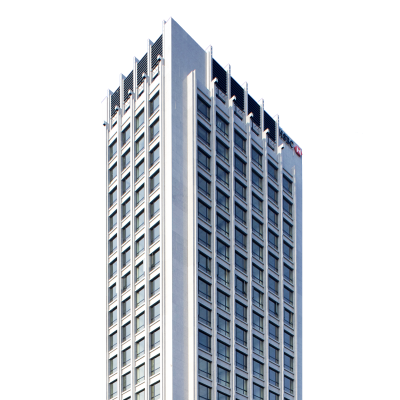 At the corner of the road, a semi-outdoor open space is designed for the public to rest and chill, located on the semi-outdoor part of the 11th floor. The semi-outdoor infinity pool space echos the retreat of the building floor as well as the corner of the road. The main facade of the building faces southeast and adopts 1-meter deep vertical wood-grain grids and deep windows to reduce direct sunlight. Its appearance uses different materials and styles to demonstrate the different nature of the use of space, creating rich and interesting facade expressions. 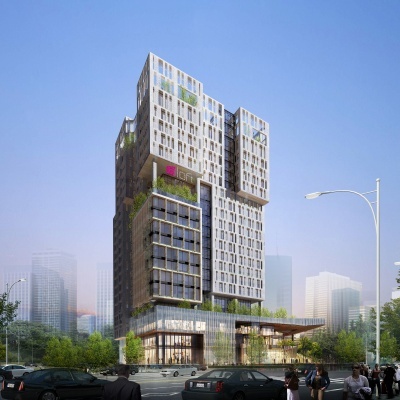 Aloft Hotel Taichung sets out to create an eco-conscious commercial building by incorporating the rhythm and topography of the hills within its design elements. The design extends the formation of the land to the skyline to form a natural curve. The façade reflects the intensity of the sun, creating an organic form of deep shading system to conserve energy and promote living environments indoors and outdoors. 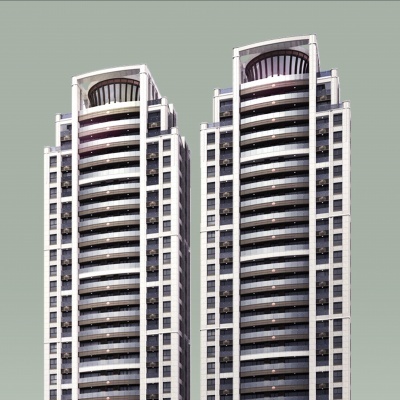 The base is located in the corner of Wu Cyuan Road and Syue Shih Road with heavy traffic. It is adjacent to the Jhong You Yi Zhong Business Dircle in the south and is close to the China Medical University in the east. It is a bustling shopping district in the old city, with the majority of customers being young students and tourists and full of youthful vitality, fashion and local specialty foods in Taichung. In addition to adding a green touch to the skyline of the old city, this greenery platform design on the corner also provides visitors with a green and peaceful viewing space in the shopping district, holding them back just a little bit from the hustle and bustle of the city. 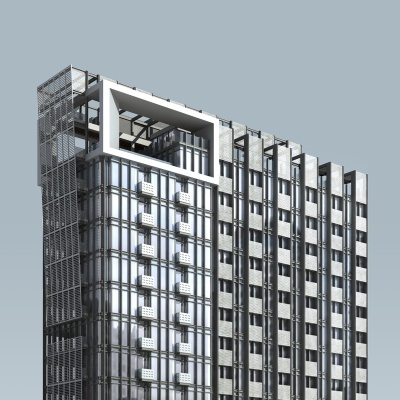 The base is located in the Unit Three area of Taichung, a young and dynamic city block. Aloft is also a hotel brand that belongs to the trend of the new generation. We hope to embody this spirit of the new generation in the space modeling. With Taichung City bathed in a subtropical climate, we propose a design concept of a new type of commercial space: a large number of multi-dimensional greening and void are used to bring the natural elements of green, light, and wind into the building; in the low-rise shopping mall space and in the hotel's public facilities, high and low air arbors, green terraces, and grass and flower corridors are embedded, connecting the shops to natural greenery by playing around the lines. On the higher floors, through the roof greenery, open-air void, and the implantation of vanilla flower beds, natural wind, flowers, and sunlight are introduced into the interior space. 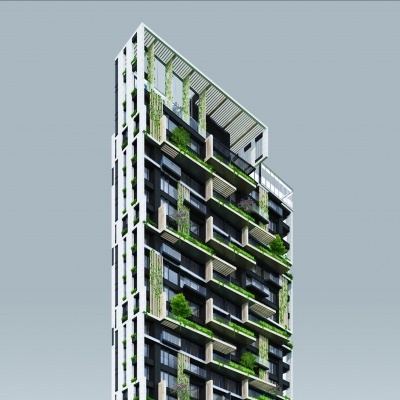 The building uses simple line senses and large-scale changes, matched with the greenery in the air, ventilation and deep sunshades to create its ecological and organic architectural aesthetics. At the same time, it gives birth to a close-to-nature, fun-filled walking tour that combines commercial space and natural ecological aesthetics. The 747 aircraft is the feature of this building and is what the design is based on. 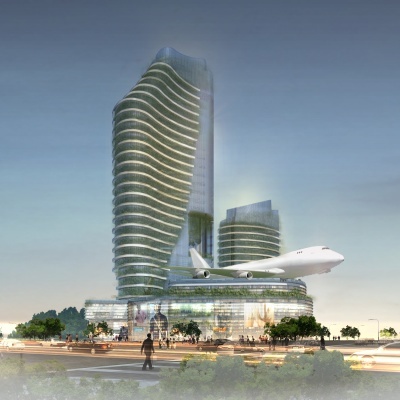 The shape of the building is like the streamlines of the wings, and the greenery sweeps across the skyline like the aircraft dominating the sky. It creates a brand new, green ecological landmark for the beach in Pattaya.